Since 1988, Premier Pool Service has been leading the way and revolutionizing the swimming pool industry by bringing new technology to efficiently and profitably manage operations, as well as raising the bar in the quality of construction and a customer’s buying experience. Today, we are building on our history of innovation by offering other builders and savvy business people this unique franchise opportunity. After several years of successfully licensing our brand to builders that wanted to take their small business to another level, we have moved into a franchise model and are offering more services, more buying power, and a better exit strategy to business people looking for a great return on a minimal investment. This is an opportunity to join us in the next phase of our unprecedented growth and be a part of the largest and fastest growing pool company in the world. Comprehensive Sales and Operations manual for being a successful pool builder in your regional market. We teach each of our franchise organizations how to effectively hire, train, manage and incentivize their trade partners and sales staff. Our outstanding partnerships empower us with the best product pricing and rebates unavailable to anyone else in the industry. Our management systems achieve a higher customer satisfaction rate with happy families turning into repeat customers. You’re looking for a great franchise opportunity. Why go with Premier Pool Service? Premier Franchise Management does not ask for a large monetary investment for the substantial amount of benefits that we offer our franchisees. Certainly not in respect to other companies that may offer similar services. Components such as national name recognition, trademarks, training, systems and procedures, and the franchise rights to a business with the dramatic income and growth potential as Premier Pools & Spas has experienced are rare and unique, and they will become much more expensive in the future. Since 2003, Pool & Spa News has published a Top 50 list that consists of the country’s largest swimming pool companies and the pool industry’s leaders and innovators. Since the list’s inception, Premier Pool Service has consistently held a position in their annual rankings, with multiple years in top ten positions and achieving the number one ranking in 2012. For the last two years, Premier Pool Service has been the only pool builder to have multiple locations place in the top 50 rankings. 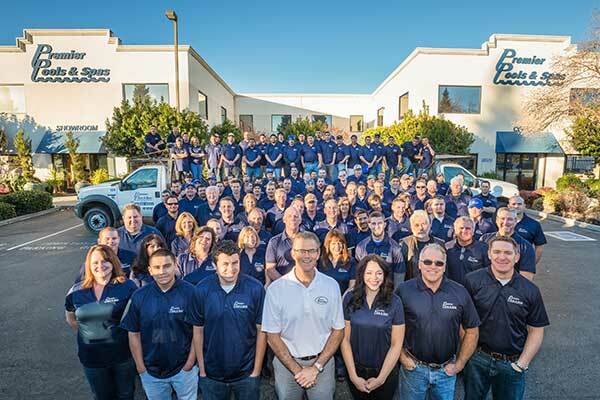 Our team of pool contractors in Sacramento, Houston, Dallas, Los Angeles and Temecula/Orange County, CA were honored as top 50 pool builders, with all but Sacramento being in business for less than five years. Your initial investment of $30,000 is far below the average cost for most franchise opportunities – especially ones with a growth history like Premier Pools & Spas. This low investment allows you to put money into staffing and the infrastructure that you need to make your business successful. Financing is available to qualified candidates. Premier Pool Service’s monthly royalty fees are 2.25% of gross revenues. When adding the amount of savings, rebates and services that are provided to our franchisees, the total value added substantially exceeds the amount of our fees. You are not required to open a storefront or showroom as soon as you become a franchisee. We structure a plan for strategic growth with benchmarks for opening a facility, hiring staff, and expanding your territory, if desired. Before training is completed and construction partners are secured, we will already be working on getting you a presence on the internet and working on getting good placement for your location on search engine pages. We recognized that the internet is the single most important marketing tool for our sophisticated buyers and have a team of experts working full-time on our internet marketing. Are you a great builder who is looking for a way to take your business to another level but not sure how to do it? Premier Pool Service has a 26 year proven business model that has already help over forty builders like you become leaders in their local markets in a short amount of time. When you become a Premier Pools franchisee, you immediately become part of the country’s largest and fastest growing pool company, have instant brand recognition, great buying power, better warranties, and cutting edge marketing services and support. Our company culture is unlike any other as our franchisees are supportive of each other, share knowledge, and celebrate successes.